In this article we will be comparing the two pressure cookers “Instapot Ultra” and “Duo” from same company. The different features will help you out to choose the best one for though their designs are same. So, let’s have a look at their comparison. Things. It is very popular model and comes in Three different size option within reasonable price. It cannot sterilize or control temperature. 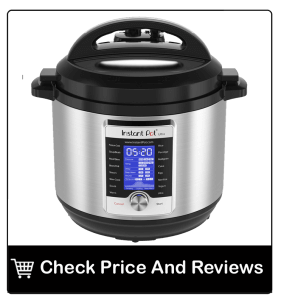 The Instant Pot Ultra features the same functions 10 in 1, as the Instapot Duo does except these additional functions like Cake maker, egg cooker, Ultra, and Sterilize. Further, the display is more appealing as compared to Duo. It upholds the auto-closing valve which means their is just one step between you and delicious dish. However,its knob is bit sensitive and hard to utilize as compared to Instapot Duo. The “Ultra” function allows the manual setting of temperature for accurate cooking. It’s less instinctual and uses a knob in place of buttons. Most of the people like the Duo to get the job done and it is available in very captivating price. In the same way, the Instapot Ultra, features excellent functions and make your cooking easier and delicious its just $50 more. But if you are a person who wants some fancy type of stuff in their kitchen and can afford more cost then Instapot Ultra is a good selection for them. 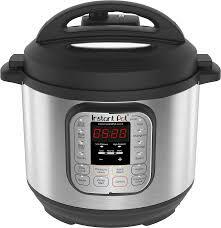 However, Ultra Instapot is great with the auto-closing feature, that’s mean your pot is properly sealed. Whereas the Duo needs to be sealed manually, in order to build up the pressure which you can say an extra step as compared to Ultra. Next, with the visual representation on the display of Ultra you can see the temperature of your food and at what stage is your food is. Besides, this feature is not available in Duo pot. 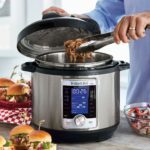 Above all, both Instant pot ultra and Duo Instant pot are incredible products. Although, both pressure cookers seem to be worth getting but the choice is yours. If you only want a product for pressure cooking then Duo is a great choice. Similarly, the Duo can perform all functions at a fair price. 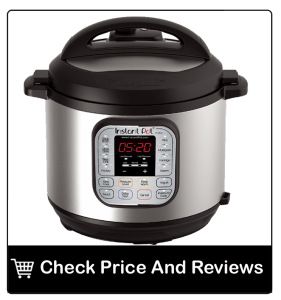 On the other hand, If you want high-tech bells, fancy interface, sous-vide program, and altitude adjustment in your kitchen then cost is not an issue go for the Instant Pot Ultra.